MIT has finished uploading all of their 1800 courses, so now one really could get their free computer science education, online. Though it gets better. 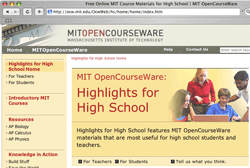 Now there’s a new portal website that brings up highlights for high school students, from the same set of MIT level courses. It’s mostly just a subset of the introductory courses, but there are some just for high school as well. The way this works is that since the introductory courses are designed for those with little background in the field, a high school student with some interest in the subject should be able to keep up. A quote from the website, credited only as “John, the high school teacher”, sums it all up pretty well. [The MIT] videos afford students an in depth perspective into MIT scholarship and it is inspiring. It inspires them because it lets them know that they can understand and appreciate these difficult concepts on the level of MIT students…Many don’t fully understand how great their potential is. This brings it home in a way I never could as their high school teacher. And there’s more to choose from. So to high school students, I’m going to quote Clayton on this one, “Challenge Yourself”. MIT courses + compsci forums = awesome. I love that. I’m looking at the very first course in the Computer Science/EE program and It actually seems relatively accessible for someone with no background in programming and no room in my high school schedule for computer science! Its good, its going to lead to a general higher level of programming everywhere. Im going to make sure to get my kids onto this. One of my sons is currently struggling with normal level computer science/ information systems. So hopefully this helps him and i might find some of the stuff interesting for myself.